Ship Ahoy is a Standards-based Fundamental Movement Skill Game that is perfect for Kindergarten and Elementary level PE programs. The game focused on Running and Balance. It requires no equipment and can be played in a gym, a large classroom or outdoors. Students to scatter ﬁnd their own personal space within the playing area away. The teacher tells the students they are on a huge ship and they are all sailors. The teacher is the captain. The captain calls out different commands which the sailors must fulfill. 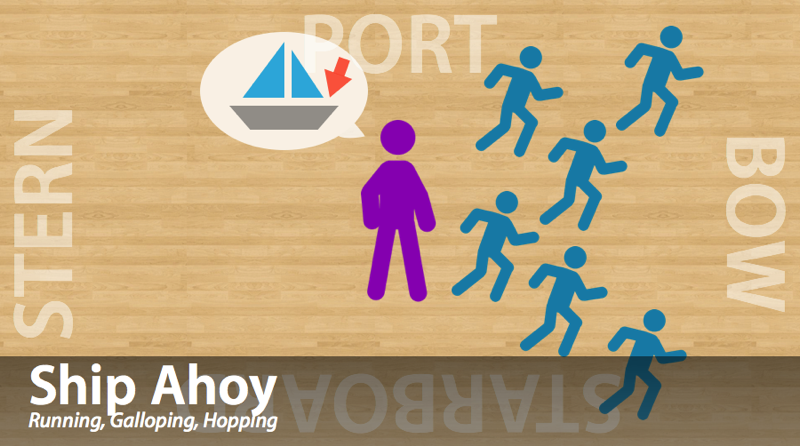 Students must run to the front part of the ship (the gym). Students must run to the back part of the ship (the gym). Students must run to the right side of the ship in relation to the bow (the front of the ship). Students must run to the left side of the ship in relation to the bow (the front of the ship). Students must run back to the middle of the ship. Students lie ﬂat on their stomach. Students raise their feet up off the deck. Students kneel on one knee where they are and salute. Students lie on their back with one leg up (periscope). Students go down on their hands and knees pretending to scrub the deck. Where else do we use these skills? What type of movement skills would you need on a ship? Students should keep their eyes up to avoid contact with other students.